Happy New Year! Don’t miss the 1st episode of the new year of Up Your Vibe with the brilliant Paula Kalik. Now weekly in 2019 so you can make transformational shifts every week to make your year the best ever. 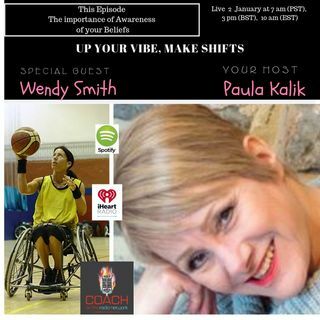 Paralympian & Training Provider, Wendy Smith joins Paula to talk about the importance of awareness of your beliefs by busting preprogrammed beliefs and finding the true potential of you. •How to discover everyone else’s programs that you run your life by. •How to free yourself from past limitations. Become more balanced and motivated. Own the new you. After suffering a spinal injury in 1989, having numerous cardiac arrests and being told she would never walk again. Wendy walked out of hospital 8 months later on crutches. She attended the Athen’s Paralympic games in 2004 as a wheelchair basketball player and has published a ‘Quickfix Guide to Wheelchair Basketball’. Wendy is a Speaker & Training Provider working in every environment from Schools (providing teacher training & pupil interventions) to government & financial institutions (providing self/hostility & behavioural awareness training). She has received an Essex Achievement Award for Overcoming Adversity, is a qualified NLP Trainer, EFT Master, Sports Psychologist, Sports Massage Therapist, Spectrum Trauma Therapist, Basketball Tutor, Level 3 Basketball Coach, Basketball Referee & Classifier & Business Coach.